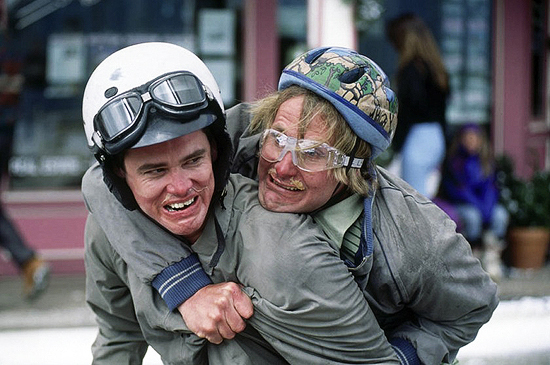 Director Bobby Farrelly Reveals Plot for The 'DUMB & DUMBER' Sequel! Since we first heard that Jim Carrey & Jeff Daniels were in discussions with Bobby & Peter Farrelly to develop a sequel to their 1994 masterpiece Dumb & Dumber we have been salivating for details. Digital Spy caught up with Bobby who revealed a bit about the film's plot. "I can tell you that there is no growth out of either one of them and it's 20 years later... these guys are in regular life and they're still basically children at heart, The story revolves around the fact that one of them may have sired a child. They want to go and find the child because he's having a kidney problem and he wants to ask him for one of his kidneys." The movie was given a prequel in 2003 with Dumb and Dumberer: When Harry Met Lloyd without the creative involvement of the Farrellys. The Dumb & Dumber sequel will start shooting early next year. I'm reading: Director Bobby Farrelly Reveals Plot for The 'DUMB & DUMBER' Sequel!Tweet this!